Also for the FW19 season, SUPRA comes with a strong Crown Collection with progressive designs in Footwear & Apparel, where our focus lies on comfort, fit & wear and usage of latest technology for outsoles, sockliners, seam sealing, tar, etc. Although we have a mind-boggling, crazy theme called Repre$ent in our line, we choose not to go too crazy in terms of colour, but in looks and aesthetics. After launching the Greco this year, which really resonated very well in the market, we come with another signature shoe in classic, Italian 70s style, the Greco Loafer. Fully functional and technical, this slip-on is Jim Greco’s favorite, because it stands out so much, looks like a dress shoe, but skates so well. After elaborate wear & tear testing, Lizard King is very stoked to announce his signature shoe for FW19, obviously The Lizard. 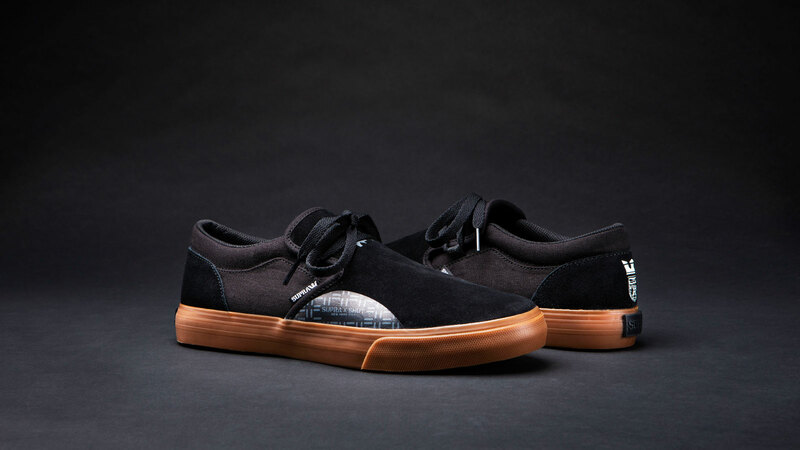 Vulcanized outsole, suede vamp, super durable and a fake-lizard skin leather heel construct make it truly his. Crazy as he is, it comes in black/white, red/white and a freaky black/purple acid-wash colorway. Only for Croen accounts, we offer some pretty sick collabs with Shut NYC and Deathwish. For the Shut NYC collab, we used a black-gum Cuba, a super comfortable slip-on. The Deathwish collab is with the Lizard pro model, as Lizard is also very much involved in Deathwish. This way, everything makes sense and comes full circle. For sure the collabs and The Lizard. The Chino’s are super price/value products, so those are the no-brainers. Our PUSH technology, which has been developed with our riders for several seasons. PUSH stands for “Performance Utility Shock Heel” and is a new light-weight performance insole, made with odor-resistant high density foam. It captures the elasticity of your momentum and adds propulsion to your step. Many words for: comfort and feel.